The modern real estate agent now understands that content marketing is a requirement for growing a thriving business. However, generating enough content to outrank the competition is proving to be a major challenge for many. As a result, more and more agents are tempted to borrow or even steal content to keep up. Meanwhile, others are struggling to buy the right types of content to get them real results. 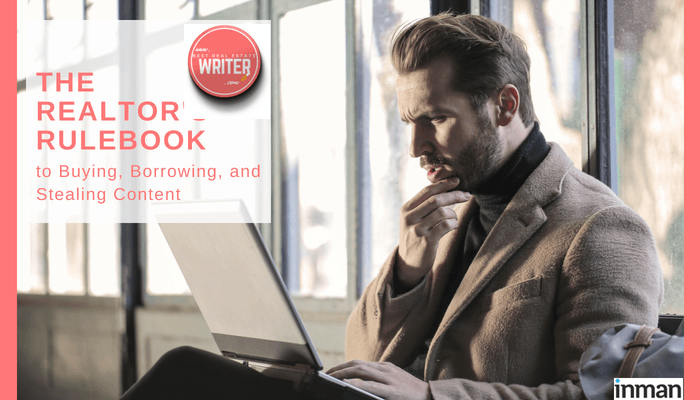 Here’s what you need to know about buying, borrowing, and stealing content, so you don’t make a fatal mistake in your marketing. If you are like most real estate agents, you are more interested in managing clients and transactions than you are writing blogs or video and podcast scripts. Therefore, you may want to hire a professional real estate content writer to ghostwrite your content for you. Many agents opt to purchase bulk content like blogs on the cheap. However, beware that these mass-produced blogs will only serve to damage your SEO and drag your website to the bottom of the search engines because they are considered to be unoriginal and invaluable by sites like Google. If you’re going to buy your content, make sure it is always original and ethical. The true rock stars of copywriting will not only be able to write blog articles for you, they will be able to dramatically improve your search engine optimization (SEO), they will position you as an expert in your area, and they will be able to attract your ideal customers to you. From time and energy saved to clients and cash gained, investing in a real estate content writer is a no-brainer. But how do you go about hiring one? You can save on hiring an overseas writer to produce your content for you but you will spend more time teaching them about real estate and writing in proper English than you will be selling real estate. Considering the fact that content marketing is 69% more effective (and less costly) than traditional real estate marketing methods, you should be willing to devote the majority of your marketing budget to your writer. The community of U.S. based real estate copywriters is extremely small. To find one, you can run a Google search for the best real estate writer or post a job to job boards like SnagAJob. Just be sure to interview a writer before hiring them to be sure that they are fluent in English, SEO, content strategy and real estate. Often, content service providers will allow you to post their content on your website as long as you list them as the author and link back to their website. In the past, this was considered good practice by some SEO experts because it allowed agents to add content to their site frequently. However, these days, posting “borrowed” content does more to hurt you than it does to help you. Remember that you are spending a lot of time and money to get traffic to your website and the last thing you want to do is drive that traffic away by linking to other websites. Furthermore, consider the fact your content is meant to position you as the local real estate expert, not someone else. When you borrow content written by others, it is like you’re telling people “I don’t know enough about X, but this person does so check out what they have to say.” That is a dangerous message to put out there. Nervous about accidentally using another agent’s or sources content? Sign-up for an account with Grammarly, a spelling, and grammar software that will also check your content for plagiarism. Make sure that all of your content is plagiarism free before you upload it to your website or you will pay the price with search engines. Stealing content is never a good idea. Not only is it an unethical business practice, but it could cause you to be sued, have your site permanently deleted from search results (by Google) and severely damage your credibility. Not to mention, stealing content is flat out illegal! However, there is nothing wrong with looking at other agent’s content for inspiration. For example, if you notice another agent is doing well by producing hyper-local content like school reviews, there is nothing wrong with creating the same type of content in your market. Just be sure that your content is unique, original, and valuable to your ideal clients. There is no question that creating original content is a must in today’s digital era of real estate. Those agents that can create and post the most valuable and unique content will be able to build the most dominant web presence, and ultimately crush their competition. If writing is challenging for you, try hiring a professional real estate content writer and then multipurpose that content into podcasts and videos to accelerate your results.